Egyptian President Abdel-Fattah El-Sisi expressed on Saturday to Chinese Vice-President Wang Qishan his country's aspirations to promote direct Chinese investments, presidential spokesman Bassam Rady said in a statement. Qishan and an accompanying delegation arrived to Cairo on Friday to discuss boosting bilateral cooperation. The meeting was attended by Egyptian Prime Minister Mostafa Madbouly, Minister of Foreign Affairs Sameh Shoukry, Minister of Trade and Investement Amr Nassar, and the Chinese Ambassador to Egypt. During the meeting, El-Sisi highlighted the importance of the bilateral relations as well as the comprehensive strategic partnership between Egypt and China. Meanwhile, the Chinese vice-president hailed the Egyptian efforts exerted in the economic reform programmes as well as the completion of several major national projects in a short period of time, which led to encouraging major Chinese companies to work in Egypt and contribute to the implementation of these projects. The talks also touched upon a number of regional issues of common interest. 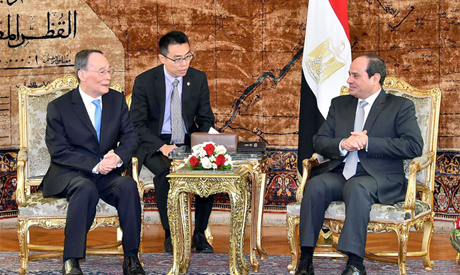 Qishan expressed his country's support for the Egyptian efforts in the fight against terrorism, uprooting extremism and reaching political solutions to resolve the crises in the Middle East. He has also stressed the support of the Chinese government to the development progress in Egypt. The vice-president stressed that the level of coordination in the political level reflects the consensus on relations between Egypt and China, noting that Egypt represents one of the most important African countries. Qishan said that the continuous high-level coordination aims at developing relations with the African continent, especially with the launch of the Chinese "Belt and Road" initiative and also in the light of the Egyptian presidency of the African Union in 2019. The Belt and Road initiative is Bejing's multibilion dollar “21st century silk road,” made up of a “belt” of overland corridors and a maritime “road” of shipping lanes. From Southeast Asia to Eastern Europe and Africa, the Belt and Road includes 71 countries that account for half the world’s population and a quarter of global GDP. El-Sisi visited Beijing in September and signed five agreements with his Chinese counterpart Xi Jinping concerning the manufacture of an Egyptian satellite, as well as a framework agreement for future projects in the coming three years. The president also witnessed during his visit the signing of a number of contracts with Chinese companies to implement development projects in Egypt with an investment worth of $18.3 billion.